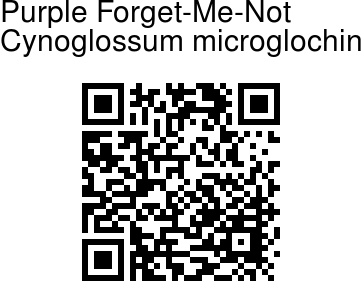 Purple Forget-Me-Not is a perennial herb, up to 12 cm tall, with dark purplish-blue flowers like Forget-Me-Not. Stem is simple or branched, hairy, sometime densely so. Basal leaves are stalked, stalks up to 20 cm long. Leaves are ovate to oblong or inverted-lanceshaped, 6-20 x 15-10 cm, pointed to blunt, abruptly to gradually narrowed towards base or base flat, densely or sparsely covered with hairs on both surfaces. Middle stem leaves are oblong, blunt, stalks up to 5 cm long, upper-most leaves are almost stalkless. Flowers are borne in lax or dense clusters, simple or bifurcate, up to 16 cm in fruit, at branch ends or in leaf axils. Flower-stalks are short, up to 3 mm in fruit and reflexed. Sepal cup is 4/5th parted into oblong-ovate or elliptic ovate sepals, 3-4.5 mm long, up to 6 mm and spreading in fruit. Flowers are blue to purplish-blue, petals ovate, 3-4 mm long. Throat scales notched, about l mm long. Nutlets are ovate, 4-5 mm long; margin appendiculate, appendage glochidiate, confluent at the base; dorsal middle area often with a prominent kell with few erect glochidiate appendages. 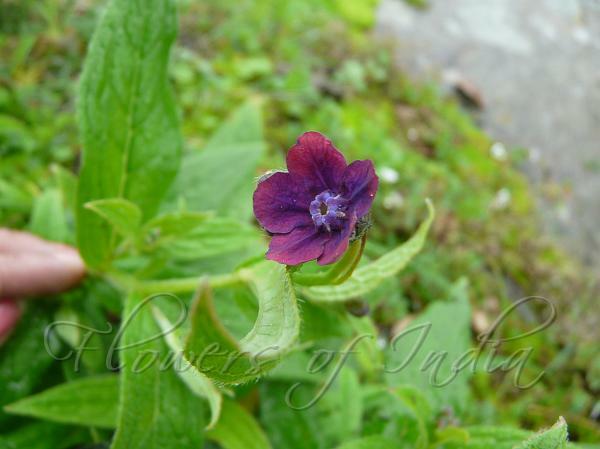 Purple Forget-Me-Not is found in the Himalayas, from Afghanistan, Kashmir to Kumaon. Flowering: May-June. Identification credit: Krishan Lal, Puja Sharma Photographed in Narkanda, Himachal Pradesh.